Today’s layout features CM’s Denim Blues paper pack and embellishments. I also used the Heart Chain border cartridge to make the large heart. I made some tiny snips with my scissors to help it take shape. In 87 days, a group of women will come together in Killington, Vt to scrapbook their memories. The group changes from time to time, but also has a loyal following. Whoever does attend ends up being in the midst of a fun, loving, supportive, and amazing bunch, who absolutely love to be spoiled by the Mountain Meadows Lodge crew. And spoil us they do. What started out as a 3 day weekend, quickly grew to 4 days, then morphed into 5 days. So everyone has the option of 5, 4, 3, 2, or 1 day. The cost is set by Mountain Meadows, there is no extra charge by me, so there are no goodie bags or frills from me. I scrapbook along with everyone else, and we all help each other if opinions or help is needed. We have a wonderful time. For rates and more info, please contact me. Hi, a new year is a good time to get back into the habit of posting to my blog. And also to my Facebook group; Vermont scrapbooking retreats group; and Pinterest. So, let’s jump right in. Here are a few pages from my Christmas card book that I just added 2015 cards to. So easy and nice mementoes to hang onto. Thank you for visiting my table today! Scrapbooking in Vermont – Join us for our Spring 2015 Weekend! Time to get your reservations at Mountain Meadows if you want an awesome long weekend full of great food, laughs, & memories! Mountain Meadows Lodge Croptoberfest Scrapbooking 5-Day Weekend! Please contact Mountain Meadows at 802-775-1010 to reserve your room! 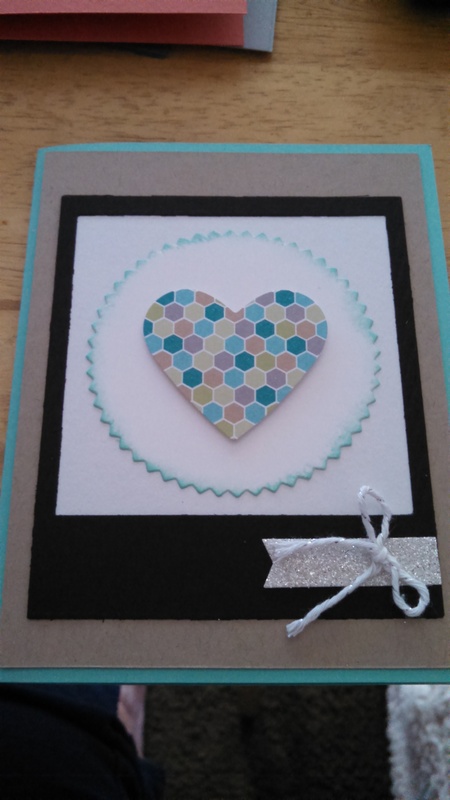 Today’s post is a card I made for a set of 10 that a customer requested. She didn’t want any greetings on the front and she wanted the insides blank. I love inking edges so decided to ink around the circle. I am going to incorporate this idea into a scrapbook page, which I will post tomorrow. Thank you for looking today!